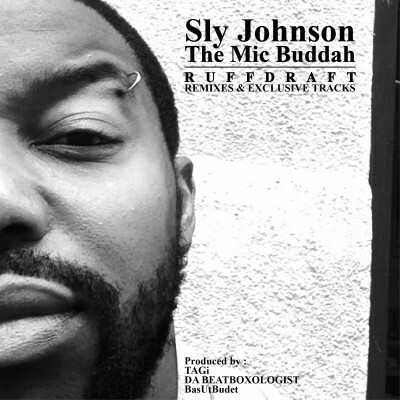 Sly Johnson A.K.A. The Mic Buddah, Bubu, Sly Jizzy, DA BEATBOXOLOGIST, TAGi (the french dude) vous présente ‘RUFFDRAFT’, produit par TAGi, DA BEATBOXOLOGIST & BasUtBudet (Suède) inclue des remixes de son précédent album ’74’ sorti en 2010 et des exclusivités avec en featuring, Sean Price (Heltah Skeltah), Dj REVOLUTION et en bonus track le 1er single ‘EVRBDD (Everybody Dancin’)’ issu de son nouvel album à venir. Au long de ce voyage (re)découvrez l’univers HIP-HOP/SOUL de Sly, le Soul singer, le Beatboxer, le MC et le Beatmaker. Sly Johnson A.K.A. The Mic Buddah, Bubu, Sly Jizzy, DA BEATBOXOLOGIST, TAGi (the french dude) presents ‘RUFFDRAFT’. Produced by TAGi, DA BEATBOXOLOGIST & BasUtBudet (Sweden) ‘RUFFDRAFT’ is including some new remixes of his first album ’74’ realesed in 2010 and exclusive tracks featuring Sean Price (Heltah Skeltah), Dj REVOLUTION and the 1st single ‘EVRBDD (Everybody Dancin’)’ from his next LP.